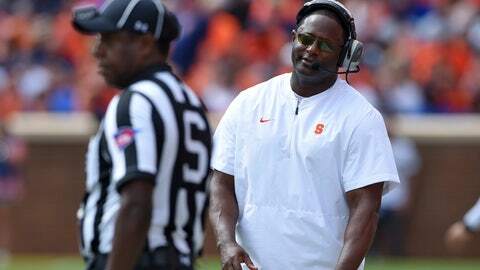 Nearing the halfway mark of his third season at Syracuse, coach Dino Babers has finally made the Orange relevant again. Relegated to a national laughingstock a decade ago during the four-year tenure of Greg Robinson , Syracuse is receiving votes again in the AP Top 25, a measure of respect long overdue for a program with a rich history. The 74 points Syracuse received this week after a 4-point loss at then-No. 3 Clemson placed the Orange (4-1, 1-1 Atlantic Coast Conference) on the cusp of being ranked as they begin to prepare for Saturday’s game at Pittsburgh (2-3, 1-1). “I’m really proud of them,” Babers said. “We work hard on our culture. I really want to be consistent with these young men. That consistency is what’s got to transfer over to the football field. I believe this team has it. We have to prove it, and this is an opportunity right now to prove it. The Orange, who haven’t been ranked since defensive standout Dwight Freeney led them to a 10-3 record in 2001 under Paul Pasqualoni, won their first four games before the loss in imposing Death Valley before more than 80,000 fans. And the unbeaten Tigers (5-0, 2-0), again in the hunt for a berth in the College Football Playoff, had to rally late in the fourth quarter for a 27-23 victory, the decisive points coming on Travis Etienne’s 2-yard touchdown run in the final minute. Despite its perfect record before Saturday, Syracuse had defeated four teams that have a combined record of 7-12. That made it difficult to gauge how far the Orange had progressed after three straight 4-8 seasons. Syracuse proved its mettle against the Tigers , whom they upset 27-24 a year ago in the Carrier Dome. The Orange knocked freshman quarterback Trevor Lawrence out of his first career start in the second quarter and built a 23-13 lead on Eric Dungey’s 1-yard touchdown run, his second of the game, with under 13 minutes remaining. Clemson responded with a pair of touchdown drives engineered by seldom-used redshirt freshman quarterback Chase Brice and its imposing defense stuffed the Orange offense, allowing just three first downs in the second half. Despite its struggles in the second half, the Syracuse offense nearly put the game out of reach with that elusive one play. Facing a fourth-and-1 from the Clemson 43 early in the fourth quarter and with the Orange leading by 3, Babers elected to go for the first down. Dungey hit wide-open tight end Aaron Hackett with a play-action jump pass for a 19-yard gain, but it was negated by a penalty for an ineligible player downfield and Syracuse had to punt. After the teams exchanged punts, Clemson drove 94 yards in 13 plays to win it. The riveting performance earned the Orange a big cheer from some Clemson fans afterward, a scene that a decade ago would have been unimaginable. Robinson was 10-37 in his four years (2005-08) and has the dubious distinction of being in charge during the only two 10-loss seasons in school history. “What did we get out of this game besides a loss?” Babers asked. “I hope the community, I hope the university saw a team that they can get behind. I hope they can see the vision that I was talking about and support this football team.